This hand-tinted postcard features Altadena's McNally house nestled in a lush winter garden with snow-covered mountains in the background. It seems to say, "Christmas in Southern California - warm enough to grow oranges, cold enough to bring snow. Don't you wish you were here." 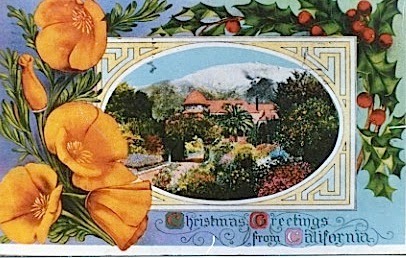 Merry Christmas from Altadena Historical Society.